You'll be £14.99 closer to your next £10.00 credit when you purchase Allied POWs in German Hands 1914 - 1918. What's this? After making the decision to surrender, the soldier, sailor or airman was at the mercy of his captors. The book examines what it felt like to surrender, the dangers involved and then the often long journey to a camp in Germany. For some the there was no journey, they were kept at the Front to help the German war effort. Not all camps were the same; some were better than others, a situation that could easily change with the replacement of the commandant, but most were poor. Disease was rife and there was little medical care. Barracks were usually cold and there were few blankets and little clothing. Men were abused, starved, denied their basic rights, sent to work in appalling conditions and some were murdered. There were thousands of civilians interned as well, who mostly fared better than combatants, however they did not have it easy. With the arrival of parcels from home most prisoners could implement their diet, but this was not the case for Russians who received little help and relied on handouts from other prisoners. Escape was a priority for many men; thousands tried, even though they could be shot for the attempt, as some were, but most failed to make it home. Then the Armistice was signed and the PoWs were freed. Some managed to walk to Allied lines, most had to wait for transport. Within a few months they were all home, except for the thousands of prisoners that were missing, that the Germans claimed they never had. David Bilton has put together a readable, popular history, complete with hundreds of period photographs that better explain a little-covered aspect of the Great War experience. His chapters are enlivened by the voices of his subjects and sources, making it a quick read. The book is aimed at the popular market rather than an academic one but even academics will find value in the sources and references made. The authors interest in the First World War was ignited by his grandfather's refusal to talk about his experiences, first in Gallipoli and later on the Western Front. As a result we benefit through books, in this one bringing together an amazing sweep of photographs and comprehensive text revealing much about the plight of prisoners of war both military and civilian. This work is a compilation of photographs with extended captions, but it also comes with a very useful text. It is an almost-impossible task to compile a work on this subject, but the author has managed to pull it together. In doing so, he has included first-hand accounts of conditions and treatment, which varied from hospitable to brutal. The Germans took prisoners on all fronts and nationalities included British, French, Belgian and Russian but also Chinese and Indian and North African troops. This very neatly fills a gap in the history of WWI and tells a history, which is often mentioned only in passing reference. 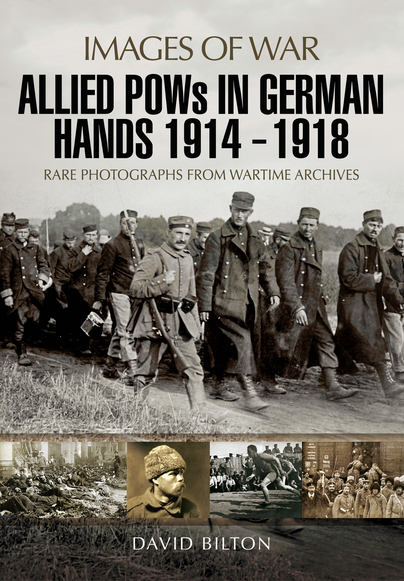 A continuation of the popular ‘Images of War’ series, this book looks at Allied POWs in German hands during the First World War. An unusual, but well-documented subject, especially from a photographic point of view, as there appears to be at least 300 images of varying quality in this book. Many of the images are staged in an effort to give a false impression to the enemy of how well the POWs are being treated. In some cases this was true, but life was pretty tough in a German POW camp made worse by disease, a lack of food and poor medical care let alone general abuse. Much thicker than previous ‘Images of War’ books reviewed by Military Modelling, the author has taken great care to not only show what life was really like in captivity but also what it was like to be captured in the first place. What is quite surprising is the number of POWs whose war was not actually over because they were retained on the front lines in support of the German war effort. One fascinating chapter called ‘Camp Life and Death’ presents the numbers of POWs the Germans were copying with. By the end of the war soldiers from 13 countries made up of 36,954 Officers and 2,374,769 Other Ranks were being held by the Germans and 111,879 interned civilians. The arrival of Red Cross parcels made life a little more bearable for the British, but not all nations received them and the likes of Russians were left begging for handouts. The true hardship of POW life can never be represented in black and white photographs but this book by retired teacher, David Bilton goes a long way towards trying. Highly recommended and thanks again to Pen & Sword for our copy.